Feb. 6 | Celebrate International Frozen Yogurt Day with Free Yogurt @ Yogurtland! - EAT WITH HOP! Home / CA ORANGE COUNTY / DEALS / DESSERT / YOGURT / Feb. 6 | Celebrate International Frozen Yogurt Day with Free Yogurt @ Yogurtland! Feb. 6 | Celebrate International Frozen Yogurt Day with Free Yogurt @ Yogurtland! International Frozen Yogurt Day is coming back this year for the 7th time on February 6, 2018! It is happening from 4pm-7pm and all guests will get a chance to enjoy free fro-yo, ice cream and toppings at all participating locations. Chocolate Malt Ball Ice Cream made with Whoppers®- This tasty treat combines delicious real Whoppers, cocoa and malt powder to serve up a creamy ice cream. Similar to the chocolate covered malt ball with a yummy malt center, this flavor leads with delectable malt and is followed by notes of milk chocolate. Chocolate Wafer Bar Frozen Yogurt made with KitKat®- Bringing together milk chocolate followed by delicious wafer cookie, this flavor combines all the things we know and love about KitKats. This flavor combines real KitKat, cocoa and malt powder to serve up a delicious froyo. Enjoy these two new flavors for free and get a limited edition Hershey's Yogurtland spoon to go with it! I love kit kat anything, so I really enjoyed the Yogurtland's version of Kit Kat frozen yogurt! It honestly does taste like chocolate dessert though, but maybe even better than their normal chocolate flavor they usually have! The whopper flavored ice cream really does taste like whopper. I am not really a fan of that candy so the ice cream was just okay to me. It was delicious, but not what I would normally order! I recently got the chance to also check out the Yogurtland headquarters too! 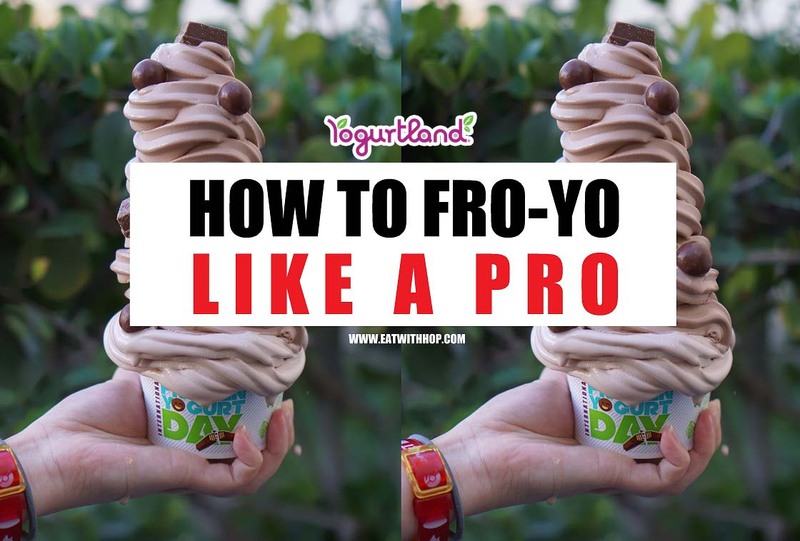 And...since I am a self-proclaimed professional fro-yo swirler... I decided to give y'all the tips on how to make the most of this day! Help support the Eat With Hop! blog by connecting on Instagram (@x3hoppie) and liking the Facebook page (@eatwithhop). Also, subscribe to the newsletter here for weekly updates to your inbox! Thanks, Taste Bud!